The Capacity Development Programme mainly focuses on teacher professional development but also includes training and up-skilling programmes for community and youth groups, environmental educators, conservation officials, etc. Teacher professional development involves the conducting of workshops with teachers and education officials with a view to supporting teaching and learning in schools. All the subjects within the new Curriculum Assessment Policy Statements (CAPS) contain aspects of environment to a greater or lesser degree. However, teachers appear to be struggling to teach about the environment because the information is unfamiliar to them as well as being quite complex in nature. The aim of the workshops is firstly, to allow the participants to engage with the latest information being disseminated by SANBI’s science/ research in order to improve their knowledge about a range of topics such as biodiversity, sustainable development, climate change, etc. that are in the CAPS. Secondly, the workshops are facilitated using a variety of teaching methods and activities which allow the educators to improve on their own teaching methods and assessment practices. In addition, there is always an emphasis on relating the environmental topics in CAPS to the learners’ local contexts as well as promoting the need for environmental action. A recent report on career promotion in the biodiversity sector revealed the need for information about biodiversity careers to be provided at both primary and high school level. 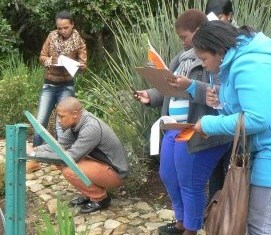 One of the ways in which the directorate promotes biodiversity careers is through the teacher professional development workshops with the biodiversity career information being either the core focus of certain workshops or being included as a number of activities within other workshops. Training for the staff members of environmental organisations, community members or youth groups is done in response to ad hoc requests, and the content of each workshop is dependent on the needs and interests of each group. The up-skilling programme focuses on attracting and retaining young people into the sector through training and work-based experience.